A SpaceX Falcon 9 v1.1 rocket launches from Cape Canaveral, Florida. The Falcon 9 return-to-flight mission will be the first of an upgraded version with increased performance. PASADENA, Calif. — The return to flight of SpaceX's Falcon 9 rocket, still a "couple of months" away, will also be the first launch of an upgraded version of the vehicle with increased performance, the company's president said Aug. 31. Speaking at the American Institute of Aeronautics and Astronautics' Space 2015 conference here, Gwynne Shotwell said the company was working through a series of intensive reviews of the Falcon 9 after its June failure while preparing the latest upgrade to the vehicle to increase its performance. 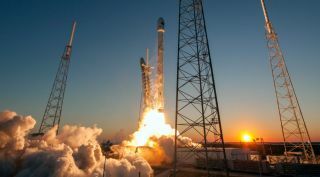 SpaceX had been working for some time on a upgrade to the current Falcon 9 v1.1, sometimes called v1.2, that features engines with increased thrust, providing an increase in performance of about 30 percent. That first launch of the upgraded Falcon 9 was scheduled for September before the June 28 launch failure. Shotwell said after her panel session that there is a payload assigned to that return-to-flight mission, but could not name it without the permission of the customer. Prior to the launch failure, SES was scheduled to launch its SES-9 satellite on the first upgraded Falcon launch. SpaceX blamed the June launch failure on a broken strut holding down a helium bottle in a propellant tank in the rocket's upper stage. Helium leaking from the bottle then caused the tank to overpressurize and burst. Shotwell said SpaceX still believes that is the root cause of the failure. Shotwell added that while this problem is relatively straightforward to correct, SpaceX is also examining the vehicle for other potential issues. "What we wanted to do was to take advantage of the lessons that we learned from that particular failure and make sure we're not seeing something like that anywhere throughout the vehicle," she said. That includes a series of top-down reviews, and having the work done by every company engineer checked by another engineer. That additional investigation has delayed the vehicle's next launch. While SpaceX Chief Executive Elon Musk said in July the vehicle could return to flight in September, Shotwell suggested it may be November before that launch takes place. "It's taking more time than we originally envisioned to get back to flight," she acknowledged. "We're a couple of months away from the next flight." Shotwell remained optimistic about not just returning the Falcon 9 to flight this year, but also successfully landing the vehicle's first stage, either on an oceangoing platform or a pad on land, as part of SpaceX's efforts to develop a reusable version of the vehicle. The company has attempted landings of the first stage on its "autonomous spaceport drone ship" after launches in January and April, but neither was successful. "I want to see a Falcon 9 first stage land on a drone ship or land on my landing site this year," she said. "I want to stick a landing this year."